SHOW DESCRIPTION: Aksyon (lit. Action), is the flagship national network news program broadcast by TV5 in the Philippines. 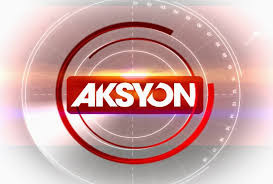 Its main primetime weeknight edition, also known as Aksyon Prime, broadcasts from 6:00 to 8:00 pm (PST), and is co-anchored by News5 Chief Luchi Cruz-Valdez and veteran news anchor Zsa Zsa Padilla,Vina Morales.